Hi, folks! I’m here. Finally. The back is not much better, but, I can’t just lay around! LOL It isn’t going to happen! 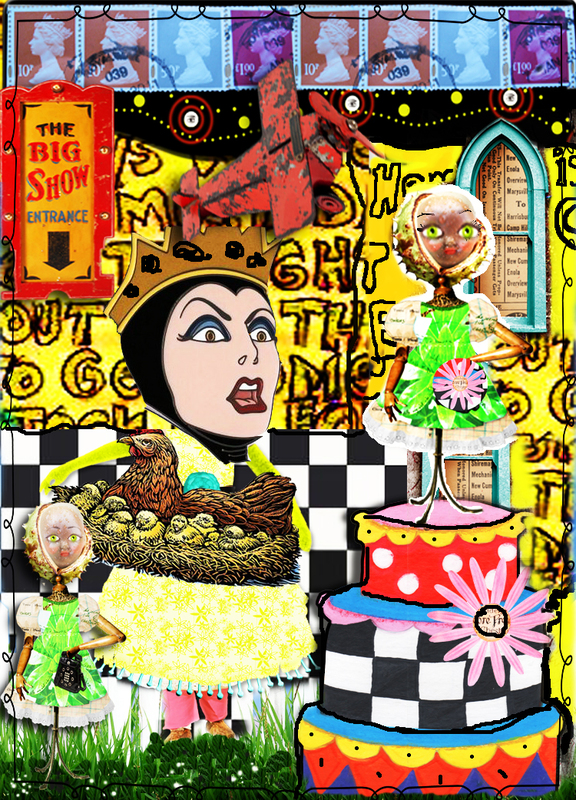 This is my off week with the collaborations with Miss Edna, so, I thought this would be a good time to give you some links to sites I have found that I want to share. This month, over at Digital Whispers, we had a couple of really neat learning experiences, as usual. But, one stood out among the rest. I think I mentioned it before, but, we did a “Zetti” Round Robin. We each took turns adding our own ‘part(s)’ to one image. The end result was so fun! LOL That’s what “Zetti” is. I read one definition, that it is a hodge-podge of body parts. That one seems to be the best since body parts are a given in Zetti. In my research on this art style, I came across some interesting things. So, here we go! Starting off the list is “The Sum of All Crafts”. This chick dabbles in a little bit of everything craft-wise. Valerie has an awesome blog. When you first see it, especially if you are a digital artist/designer, you think you’ve stumbled upon a hybrid crafts site. Along the top menu bar are topics such as “Swirly Flowers” and “Punch-Art Samples”. These are the cutest ornaments and flowers for embellishing anything you make. But, that is not it! Well, it is that, but, it has much, much more! She has, literally, hundreds of downloadable vintage images for use in crafting and art. Check out the side bar “Labels”. She has quite a bit there, all categorized for you! Near the bottom, under Zetti, I think, she has some great ‘parts’. Beginning January 23, 2011, Valerie released a set of images to use in making Zetti art, or any kind of art for that matter. There are arms and heads and some neat mechanical parts. LOL You got to check it out. The give away of the Zetti/Steampunk stuff runs for thirteen(13) days, so, make some time and enjoy all this chick has to offer. I bet there is something there you will like! The next link I have for you came about as a necessity. During our Round Robin, because of uploading restrictions, we each did our part to the image, changed it to a .jpg image and uploaded it to our forum for the next person to add to it. Obviously, as .jpgs, we can’t move anything around or make adjustments of any kind. It makes for an interesting Round Robin, but, we were all so new at it. I recalled seeing, and even using once, a site named Min.us. I think I even blogged about it here. Without even registering you can upload and download files. What we did is, when the first person added their parts, it was left in .psd format and uploaded to Min.us. Uploading generates a link, so, we placed that link on the forum for the next person. This way, we were all able to slip our parts in and around everything else, thus, allowing everyone’s goodies to be seen. Fortunately, we were all using Photoshop for this challenge. It’s an idea. If you have anything you want to share quickly, a preview, a color swatch, a revision, whatever, drag it into Min.us and share away! This is what my screen page looks like with one preview to share with Miss Edna and the .psd file for the Zetti Round Robin. It isn’t like 4Shared or any other file-sharing site. There is no waiting or countdown clocks. You just upload and/or download. You don’t even have to register, though I did. It is so easy! It was this adventure that got me interested in another program called “DropBox”. 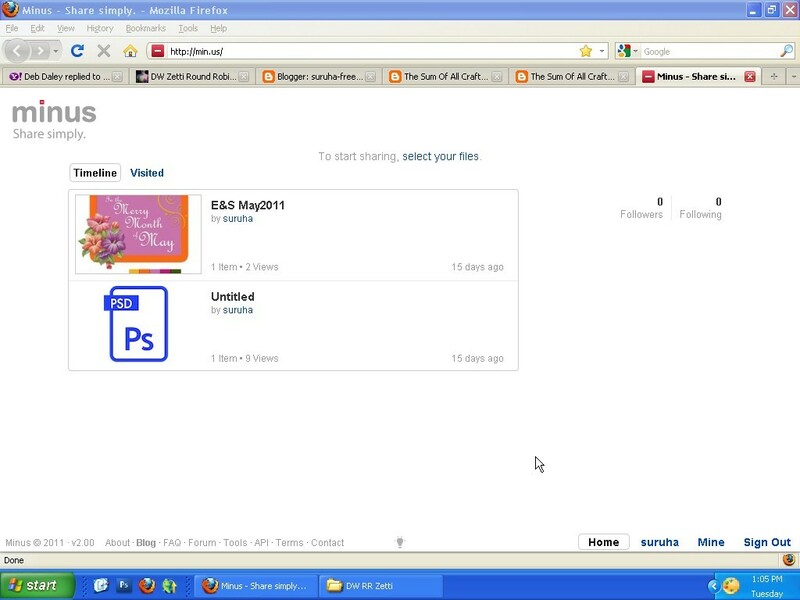 As long as you have it installed on your pc, you can access any file anyone wants you to see with a mere link. 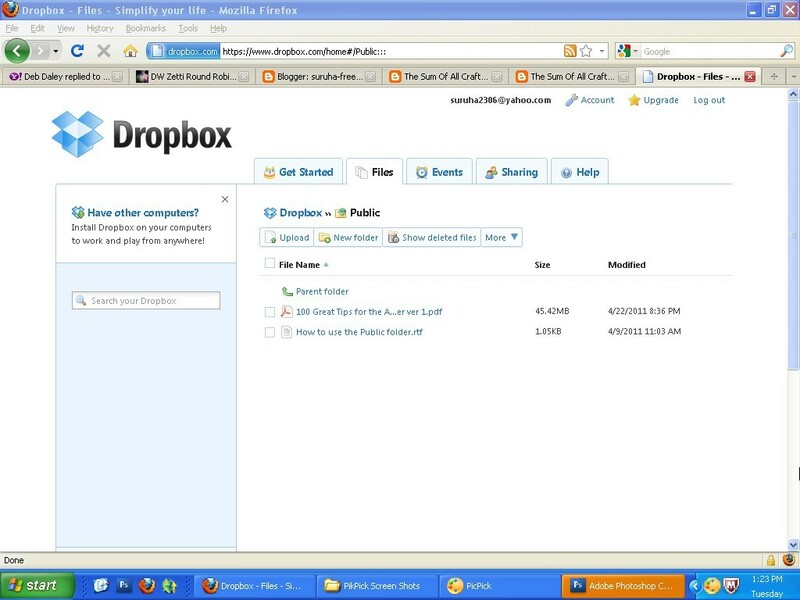 It works like this: Downlaod and install “DropBox” on your pc. Drag into that folder, any file or folder you want to share. This act generates a link. You may have to right-click on that file to get the link. Send the link to anyone else who has DropBox installed on their pc and they can access it. There is an online website where your files are listed. This is what the person receiving a file link would see, I presume. My daughter and I use it. I was given a nice free download of Photography tips. She is into photography big time! Rather than printing it out and giving it to my daughter, I plopped the file into the DropBox folder and wallah! She has access to it – straight from my pc – to hers. It’s a lot like Window’s ‘file sharing’ with your local pc’s. It opened right up as a .pdf document. I want to add that this one can be used for back-up of files, too. See the site for more info. I haven’t tried it too much, but, I’m thinking this would be a good way to share a folder of photos I want to send her off my camera. Of course, if Yahoo had a better ‘attachment’ feature, much of this sort of thing could be accomplished via e-mail. Since that is not the case, though, I have looked elsewhere for solutions. Either of these two options would work really good. I like the Min.us site for online group sharing. It worked awesome! I’m thinking that, when sharing a technique, it would be great if I could just send the person the .psd file, so they can see what I did and view my ‘layers palette’. I’ve been doing screen shots, but, the whole ‘document’ would work, too. It doesn’t even need to be zipped. I don’t think either of these sites require zipping. That’s the beauty of them. Just upload and download. Wheeee! If you know of any other sites that offer quick solutions to any scrapper, designer, artist dilemmas, leave me a link in the comments and I’ll check it out. I have one more site to tell you about. It’s PSD Fan Extra. Obviously, this is a site for Photoshop users, but, some of their stuff would be good for any use. There are a slew of these type of sites, all devoted to Photoshop craft. PSD Tuts Plus is another one of the huge sites, along with Abduzeedo, SpoonGraphics, etc. Their main function is design – web mainly. But, they all have tutorials for a broad range of wonderful images. These are designed for the user to learn new techniques with the program. They offer you a source file with all the images you would need to complete a tutorial from them, some if you are a subscribed member, while others are free. Some of them show you where they got their resources with a link – you just have to download them. One of the more popular features these sites offer is ‘lists’. For instance, one article might read that it offers the reader ‘links to 30 Beautiful Patterns Sites’. The author has listed a bunch of the popular sites that feature the selected items, with their associated images. These are quite popular! Another feature is reviews of new programs and software. Many articles include a download, most of them. Textures and patterns for Photoshop are really big. There are a ton of those sites around the internet. Some are better than others. These I have mentioned are but just a few of the top sites! I found a deal through Mighty Deals for a year of PSD Fan for $29.00 per year, as opposed to the regular price of $69.00 a year. That special is still on if you are interested. Click on the high-lighted words(link) to go to Mighty Deals. I can get lost in one of these sites, reading all the tips and tuts and seeing how others work. I have learned Photoshop with the help I get from these tut sites. Heck! PSD Tuts Plus has a series they offer to help you learn Photoshop. Known as “Basix”, the series offers tool tips and instructions for each of the features in the program. “Basix” is listed at the top in the menu bar, or, access it here. Though most of these sites are geared towards web design, they try to aim to benefit the most people. PSD Fan is coming out with a Blogging site, geared more for the bloggers out there. Smashing Network covers a bunch of design sites. In fact, Networks are quite the thing! With most of these subscriptions, you get access to more than one site, as a rule, with the larger sites. Here is an article listing all of the “Smashing Magazine Network” websites, just so you can see what I mean.. It really isn’t that far of a stretch to go from cutting and pasting scrapbooking elements to becoming a Photoshop “guru”. Learning how to use the program to it’s fullest possible extent is what makes the difference. These sites for Photoshop users are great! Give one, or two, a try. In addition to techniques and free downloads, there are other articles of interest, too. They go into the design field with all kinds of information. I sign up to receive their updates by e-mail, so, all of my favorites come to me. Oh, and one more thing these sites do is run contests together with designers and design sites. LOL There is always some contest or another where all you have to do is comment. The offerings are prizes from sites with such goodies as one month subscription to a stock photo site, web icons, texture packs, t-shirts, books, design bundles from some of the top sites, etc. The thing is, these sites are small enough still that the odds are significantly in your favor. I’ve won several goodies. I ran across one that was over already, but, the prize was CS5! Five(5) people competed! FIVE! LOL I recently won a set of Vista Icon Packs from Icon Shock. Woo-hoo! They offered a bunch of different prizes. I just happened to win the icons. I have absolutely no idea whatsoever as to what to do with a couple thousand Vista icons. I have XP, to start with.